Today I received an email from Lot 18. One of the sites I like to promote because of the special deals they offer on wine and other gourmet items. You can get started and also get a $10 credit towards your first purchase. You can save a substantial amount on wines selections if you shop and keep an eye out for $0 shipping promotions. We’re ever so appreciative of your support for Lot18, particularly as we explore adjacent categories to complement the wines we offer. Recently, you made a purchase from our newly created gourmet-foods section, and we hope you are enjoying the order. In the future, we only expect to bring you more best-in-class, locally recognized and nationally celebrated foods. Given that this is a new area of our business, we thank you in advance for your patience and understanding. We promise that our intent is to ensure that your buying experience with Lot18 Gourmet is as seamless and as satisfactory as you and other members know it to be for wine. We’re making every effort to get to you fresh, high-quality products – whether it’s roasted coffee or hand-cut cheese – in the heat of summer, and we’ll find a way to do this faster. Please feel free to send suggestions for improvement, or for specific offers you’d like to see on our site, to [email protected]. As one of our best customers, your feedback is very important to us. We cannot thank you enough for giving us the opportunity to bring you and your family exclusive access to the finest artisanal foods. Cisco Eos® is a hosted software platform that enables Media & Entertainment companies to more efficiently create, manage and grow high-value social entertainment experiences built around their branded content. Eos’ integrated approach incorporates features from social media, content management and audience analytics into a unified, cloud-based application. Let your summer take flight. . . with hot air balloons inflated over scenic citrus orchards and rolling hills, the Fourth Annual Citrus Classic Balloon Festivalis THE best backdrop for THE balloon event closest to Greater Los Angeles and beaches. Mingle with balloon pilots, enjoy outdoor dining, wine and beer garden, browse arts and craft vendors, get active with the Kids Activity Area, relax with live music. . . It’s the perfect day trip, family summer weekend or romantic getaway – conveniently just 1.5 hours from Los Angeles! What: See hot air balloons inflate and illuminate at sunset, ascend, compete and/or tether in the early morning hours over scenic countryside of citrus and avocado groves. Hours: July 29th 5:00 p.m. to 11:00 p.m., July 30th, 5:30 a.m. to 11:00 p.m., July 31st 5:30 a.m. to 4:30 p.m. Location: 18249 East Telegraph Rd. in Santa Paula zip code 93060 (via Highway 126). See Tickets Plus for details and additional savings. Parking: Free municipal lots serviced by shuttles. Also available: For-Fee Lots accommodating 4,000 cars within .5 mile of festival grounds (walkable or short shuttle.) See Maps, Parking & RVs for highway exits, tips for quickest exit times. Festival Entertainment: Evening Balloon Glows, Sunset Wine Dinner, Sunrise Balloons Ascensions or Tethers, Skydivers & Aerobatic Planes, Live Music, Wine & Beer Tasting Pavilion, Glow of the Blue Moon, Field of Dreams, Jim Colborn Celebrity Exhibition Game, Wine & Beer Garden, Car Show, Indian Motorcycles Display & Rally Ride, Vintage Tractor Display, Zipline & Rock Climbing Wall, Kids Activity Area, Arts & Craft Vendors, Recycled Art Contest, Plein Air Art, Food Vendors, LA Food Trucks, Souvenir Booths, Zest for Life 5K Run & 1 Mile Fun Run. 2011 Citrus Classic website last updated April 5, 2011. Check back for monthly updates. REGISTER FOR BREAKING NEWS, COUPONS & DISCOUNTS VIA OUR E-NEWSLETTER. Today kicks off the 18th Annual Oxnard Salsa Festival. July 30 & 31, 2011 Food! Music! Dance! The Belle Brigade play a FREE show at Levitt Pavilion Pasadena on Sunday, July 31. The brother-sister duo are going places, from their Satellite residency back in January to touring with some huge names (DMB, anyone?). But before you head to Pasadena, snag a free download of their captivating track “Sweet Loise” and get hooked. Sign up here for to get our weekly email newsletter with articles on saving money and getting by, events around LA never more than $10, exclusive freebies, and assorted other awesomeness. RentFoodBroke is about all the awesome free & cheap things to do in LA. Tell your friends who you know would love RentFoodBroke as much as you do. Share on Facebook, and spread the good word to everyone you know. sign up here and get in on the fun. The first annual Unique LA Summer Show is going on this weekend in Santa Monica. Find awesome, local, handmade goodies. Extras & Amenities, including free workshops, an eco lounge, and two cafes featuring some of LA’s best restaurants and gourmet food trucks. Dude, fun. It happens only a few times a year, so get while the getting is good. Clothing & Accessories • Stationery • Jewelry • Housewares • Artwork • Ceramics • Gourmet Edibles • Plush Toys • Books • Photography • Screenprints • + more! If you visit TeakSeats.com, you can have loads of information about the teak and the different kinds of furniture you are looking for. 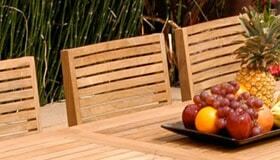 The website caters to the aspiring buyers who want to buy the teak furniture but do not know from where to buy. This is an informative website to get the customers know the kinds or brands of furniture best suitable for them which they would love to buy and from where they can buy the same. If you go to its different sections, you can see several beautifully designed chairs and tables at the display and also description of what makes the furniture so unique. As the owner of this site himself says that it is all about what teak furniture is, the type of teak furniture suitable for you and some suggested company websites from where you can buy the same. From this website, you can also have information on how you can maintain the furniture after buying the same. As teak furniture is not cheap and is a one-time purchase, you need proper information to make the right decision. This website TeakSeats.com tries to solve this purpose. It is the best guide to make purchasing your furniture easy. If any question you would like to ask, you can put your query in their ‘contact us’ form and all your questions will be answered. TeakSeats.com no doubt is a great attempt beneficial both for the buyers and the furniture companies as they can get easy buyers. So visit TeakSeats.com before your purchase and get the best value of your money. Stager the report requests every four months, since there are three reporting agencies. The Outdoor Cinema Food Fest is an outdoor event series dedicated to creating and nurturing a community of entertainment and food enthusiasts in Los Angeles. Introducing new food trucks every week, Outdoor Cinema Food Fest is the ultimate picnic – no basket required. Watch movies on the LARGEST outdoor movie screen on the west coast, standing three stories tall and 52 feet wide. TICKETS $10 – available in advance and the door. www.outdoorcinemafoodfest.com Movies + Park + Food Trucks = Amazing Night! Every Saturday, May 28th – September 3rd, 2011! The Ultimate Picnic. No Basket Required! Movies + Gourmet Food Trucks + Emerging LA Music Artists in Los Angeles. PopSugar City is the online leader in daily offers for trendsetting Y women. PopSugarCity.com is an online women-focused city guide that provides access to exclusive daily offers from a well-edited selection of local businesses in beauty, health and fitness, dining, travel getaways and other relevant categories. PopSugar also features exclusive incentive offers on our editors’ favorite national brands. Sign up so you don’t miss a single PopSugar City offer! Get ready to experience the hottest restaurants, bars, spas, salons, and boutiques in your city for as much as 80% off! Each day, they email you one exclusive, unbeatable offer or editor’s pick covering the best things to do, see, eat, and buy in your city. This is my drum beat. 3 days of panels, workshops, showcases, battles & networking events! Visit the official Dynamic Producer Expo, a Production Marketplace held in collaboration with Beat Swap Meet and featuring specially invited vinyl vendors and record collectors selling/trading Hip-Hop, Soul, Blues, Rock, Jazz, Punk, World, and Reggae 12” and 45 records. The marketplace will also feature professional music service providers in the legal, promotions, web, publicity, distribution fields as well as vendors selling sounds, music apparel and unique services such as custom painted gear customizations. Join DP’s Founder, Felisha Booker, Dynamic Alumni, Conference Instructors, Mentors and Industry Executives as they welcome you and give tips on how to best maximize your time during the 3 day event. You have to know where drums have been to know where YOU’RE going to take them next. During this audio/visual presentation, our instructors and special guests will take it back to the ‘70’s and discuss impactful drums periods throughout the years, the game changers, and their importance. Impromptu beat battle of westcoast producers vs producers from all other regions. Get your drums on track by learning tips and techniques in layering, filtering, compression, sampling, patterns, shifting, quantization, and creating original drum sounds using organic, live, analog, and digital methods. In this open session, the first 50 registered attendees will have an opportunity to have their drum sounds played for review and recommendations from workshop instructor and special industry guests. This is a great opportunity to not only receive feedback on your music, but to learn from the feedback that others receive as well through live demonstrations. Instructors will also be available throughout the entire conference to answer questions one on one. Get your drums on track by learning tips and techniques in eq’ing, compression, reverb, transient designers, fine tone, and parallel compression when mixing drum sounds. In this open session, the first 50 registered attendees will have an opportunity to have their drum sounds played for review and recommendations from workshop instructor and special industry guests. This is a great opportunity to not only receive feedback on your music, but to learn from the feedback that others receive as well through live demonstrations. Instructors will also be available throughout the entire conference to answer questions one on one. During this major producer panel, established music producers play some of their most known drum sounds and share the stories behind the tracks. Panelists will also share impactful experiences in networking, production, collaborations and placements. You have no idea what the potential is with your music, until you hear these skilled songwriters freestyle Pop and R&B songs over your tracks. This is a can’t miss event! 10 producers battle with their best hard hitting, hip-hop style tracks for cash and prizes, but most importantly for RESPECT. Join us while we visit the Grammy Museum, which explores and celebrates the enduring legacies of all forms of music; the creative process; the art and technology of the recording process; and the history of the GRAMMY® Awards, the premier recognition of recorded music accomplishment. This will be the last official event of the conference. After you sign up for the event, your registration will be confirmed within 72 hours! To submit for showcases/competitions go HERE! Straight Talk is one of the best options for those looking to save money. You can cut your cell phone bill in half. You have to be crazy to be on a contract these days when you can get everything you need without one. There are no contracts, no surprise bills and no credit checks. Great nationwide coverage and excellent reception/connectivity. Finally, Straight Talk only uses trusted phone manufacturers like LG, Motorola, Kyocera, Nokia and Samsung. STRAIGHT TALK is the best way to save and enjoy the flexibility of phone choices. • Straight Talk International Long Distance Service is a flexible prepaid calling service that enables you to make international calls from your home, cell or office phone at low rates. So don’t hesitate to call a friend. As new technologies are gearing, to utilize the same are also on the rise brains who are using their keyboards to break the walls of the most powerful antivirus programs. But these malicious elements do not know there are great masters of antivirus modules such as VIPRE too who can tie together antivirus as well as antispyware together into a single, software tool. The technologies combined together give you a great performance in the software that does not allow your PC to get slowed down and also makes it very simple too to give complete protective cover to your PC. VIPRE antivirus has proved itself to be strong and stunning as with it we feel totally safe. It happens to be really great, as it does not obstruct the work during its installation process. Secondly unlike other antivirus its “protection technology” makes use of the signature matching and heuristic analyses so even while you are in a process of scanning, you can carry on with your work smoothly. Earlier I had installed Norton Antivirus but to my dismay it was giving me a lot of trouble, as the speed of my computer would often get slowed down. But now it is no more, as now I have the protection of VIPRE; it has given my system complete protection that I needed. This antivirus is truly amazing and the most efficient of all the antivirus programs I have ever known. It generally just finds few cookies at the background and with so much of ease and efficiency it operates that it really makes your life on your own net world great. SALE – Friday July 29th Only! Wild Alaskan Coho Salmon season is in full swing! What better way to enjoy this fresh catch than with a One Day Only Sale Friday, July 29th only! Coho salmon fillets from a Marine Stewardship Council (MSC)-certified fishery are hand selected by Whole Foods Market’s Alaska port buyer who spends the summer at the port choosing the freshest salmon to send to our stores – within 48 hours or less of the catch! Quick and easy to grill, bake, broil, poach or sauté, orangey red-hued coho is full-flavored salmon that makes a perfect canvas for recipes like Rosemary-Lime Wild Alaska Salmon Kabobs, Poached Wild Salmon with Skillet Tomatoes, Mini Wild Salmon Cakes, and Wild Alaska Salmon and Avocado Salad. Sales valid at Whole Foods Market locations in Arizona, southern California and southern Nevada. While supplies last. No rain checks. Restrictions may apply. Visit your local store for more information and other great deals. Reports are that Nissan is blowing past all estimates in number of units sold. Owning production number 6023, I know that there have been at least 6000 vehicles sold, but now reports are that the number is closer to 11000, production and assembly continue to increase with big plans for plant production increases in TN. The Nissan Leaf is very popular by all estimates, dealers have a hard time getting them and if someone with a reservation cancels a new buyer is ready and available to jump in. Early this evening I saw two Leafs drive by. I think the trend will continue, there is really no stopping this now. The oil companies are making inroads in the area, and know that they have to prepare to adapt and support the infrastructure of the EV movement or they will be left behind. Hydrogen vehicles are still a way off, maybe five years. In the meantime we will see tens of thousands of EVs sold. There are arguments for and against EVs, but people who need new cars and don’t want to support the oil companies, can make a difference. Range and charging stations continue to be the primary concern among owners, unless you drive no more than 60 miles per day, to allow for AC/Heat and hills. Los Angeles is full of hills, not as much as San Francisco, but there are lots of hills. If you want to save while buying your favorite products, then Save and Make Moola is for you. It’s a unique concept with the dealers who are providing the discount coupons and saving schemes come on one platform to enable the buyers to buy their products at comparatively much cheaper rates. Save and Make Moola is a one of its kind for the buyers to enter into the marketing spree with great scope for saving. Visit their website and you can yourself see how Save and Make Moola allows the dealers to make the big deals and also make it feasible for the consumers to select the products of their choice. The company provides the bigger deals, savings and great offerings to more than 2, 500 stores and has more than 17,000 coupons for the shopkeepers enabling them to make savings. Through these coupons, the buyers can avail heavy discounts and save their money which they could not have done so if they buy from the market. What’s more, you can follow Save and Make Moola on your Twitter and Facebook for any latest updates. We can save on its home page itself; on some products it is 15% off whereas on the others 30% and it goes on and on along with free samples and opportunities. Have you seen any other place where you can earn extra money too with just your visit on their website? Save and Make Moola has this purpose only. It’s a website with various opportunities too to entice the people for earning money and to enable you to catch the spirit of the age. ENCINO, CA–(Marketwire – Jul 27, 2011) – The annual Digital Media Pipeline will be held on September 7 this year and again will be presented at the Skirball Cultural Center in Los Angeles, the Entertainment Merchants Association (EMA) announced today. Digital Media Pipeline is EMA’s one-day conference focusing on business-to-business opportunities in the digital delivery of home entertainment to the consumer. This year will mark the third time the event has been presented. It is anticipated that executives from all the leading providers of movie and television content as well leading retailers and distributors of digital content will be in attendance and on the stage sharing their insights. There is ample time allocated to networking at Digital Media Pipeline, including the “skip the traffic” cocktail party. EMA will also present its annual DIGI awards at the conference. These awards recognize outstanding achievement in digital entertainment retailing, content, and innovation. More information and registration is available at www.digitalmediapipeline.com. Registration starts as low as $245. For sponsorship opportunities please contact Steve Apple at [email protected]. Bad Call – Atlanta Braves beat Pittsburgh Pirates after 19 innings! Here was the game winning call for the Braves after 19 innings against the Pittsburgh Pirates on July 27, 2011. Horrible call on the umpires part. Never got to the plate? Got him in a few places. Arm, leg.. what a bad call.